One of the most dramatic episodes of class struggle in Central America for years is currently unfolding in Honduras. 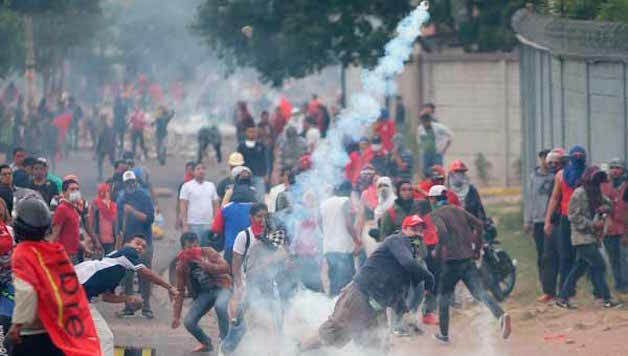 Since 2009, when the people went on to the streets en masse to repudiate the coup carried out against then-President Zelaya, we have not seen such a level of mobilisation and confrontation between the bourgeoisie and the workers, peasants and indigenous people. The catalyst has been electoral fraud committed by the ‘National Party’ and its candidate, Juan Orlando Hernández (JOH). Both the army and the police unleashed furious repression against the people which has already seen 9 killed. However, this social explosion is not just a result of the elections, but of the social, political and economic crisis which has hit the country continuously for decades. When on 26 November, the Presidential elections took place, such a development was predictable. There was widespread frustration at the incumbent President, Juan Orlando Hernández, standing again in the elections despite the Constitution not allowing successive Presidential bids. This had already led to clashes between the working class and the state. The assassination of 4 activists one month before the election also indicated the willingness of the government to result to electoral fraud against the opposition candidate, Salvador Nasralla, from the Opposition alliance against the dictatorship. Why have the masses responded so strongly? The current agitation of the masses has not fallen from the sky. 66% of the population live under the poverty line, and suffer from the consequences of organised crime and narco-trafficking which operate freely. Honduras is one of the most dangerous countries in the world, with the highest levels of social inequality in Latin America, the highest rate of unemployment and minimal public investment. Corruption is also a permanent plague. In 2015, thousands mobilised in the streets for weeks against the theft of public resources which directly hit the health sector, and had been wasted on the electoral campaign of JOH. The health sector is now completely paralysed. Then there was the murder of Berta Caceres in 2016, an environmental activist who fought against projects which stole the water of indigenous communities to benefit the local oligarchy and multi-nationals, with the clear implication of the government. Government institutions tried to derail the investigation into the crime, making it look like a robbery or personal quarrel, when the death of Berta was clearly political and linked to the state. This is the scenario of misery, anger and bravery which led thousands to say, enough is enough, and demand JOH removal from power. The exposure of electoral fraud is just the straw that broke the camel’s back. The struggles of the past, which showed the need for change which has not been realised, have been a great school. People now see electoral fraud as a way to force the fall of the reactionary government, despite the lukewarm opposition of Salvador Nasralla. The protest movement has become a genuine rebellion, not only because of the elections, but also for a radical change in the living conditions of the majority. The masses are showing that they don’t want another government of the bosses, landlords and narco-traffickers linked to US capitalism. The mass mobilisations have openly challenged the cuts and attacks on democratic rights from the government. Of course, the right wing responded with its whole arsenal, declaring a 6pm-6am curfew, and ordering the army and police to repress any demonstration questioning the institutions or established order. The mobilisations intensified on Wednesday when the Supreme Electoral Tribunal shamelessly orchestrated a fake black-out in order to manipulate the results and put JOH ahead of Nasralla who had clearly been in 1st place until then. Evidence of open fraud further inflamed the masses who started to come out massively onto the street to defend the will of the people. Though Nasralla gives speeches in support of the people and claims to stand firm against the dictatorship, his policies of pacts, and conciliation, with zero questioning of Honduran capitalism, appear as weak, boldening the right wing offensive. The only way to defeat the right wing and the capitalists is through the struggle in the streets, with an audacious socialist programme which unites the working class and oppressed of the country. The bosses, through the Honduran Congress of Private Business (COHEP) say they have lost millions through violence and vandalism and that they will take years to recover from this crisis. As always, these declarations are nothing more than a smoke screen, as it is they who led to the crisis, with their policies of privatisation, submission to imperialism, oppression, and looting of the wealth created by the working people. We completely repudiate the repression towards the Honduran people not only by the government but by its allies, the EU, OEA and US government which acts to keep its claws on the resources of the region. All these international organisms which are defined as “humanitarian and neutral” are backing the repression, as their real role is to protect the interests of oligarchy in the region. We can have no trust in the international institutions, imperialism, their laws or their Tribunals. The heroism of the Honduran workers has been more than demonstrated in its challenge to repression, authoritarianism, murders and anti-democratic measures from JOH, his National Party and the bosses’ organisations. They have shown without doubt that they have the power to escalate the movement and force the retreat of the repressive forces, as we saw on the mass demonstrations on 3 Sunday. This power has already made the Honduran state tremble. The pressure is so great that the OEA and EU has now recommended the recount of 100% of the votes. The exemplary mobilisation of the Honduran people should serve as a decisive step in the struggle to transform the country in the interests of the exploited. A national coordination must be built, democratically and representatively, made up of all the social and political organisations and the Left, which are to the forefront of this struggle. These structures should implement a plan of unified action, capable of continuing the protests, sustaining them and intensifying them, building for a general strike in the factories, countryside, small businesses, transport and in education. The struggle against this infamous electoral fraud has gathered behind it all of the popular struggles of the last years, in Honduras, Latin America and numerous other parts of the world. For the working people of Honduras, there is only one solution: break with capitalism and build a new society for all, a socialist society. Down with JOH and imperialism! Long live the struggle of the people of Honduras!